So, Does Knee Brace for Running Really Work? Initially, only injured people would use knee braces. However, in recent times, people have discovered the benefits of using knee braces for running and other sports, because the knee joint is subjected to a lot of strain and many forces when one is training or participating in a sport. If you have been active in sport for many years, then the knees are vulnerable to wear and tear, which eventually leads to injury. 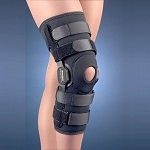 Knee braces offer protection to the knees against injury and also give stability to those who do not have stable knees. Several athletes have confessed that it is much more comfortable to have knee braces for running. Though it does not work for all knee problems, a knee brace is often needed as it helps your knee function properly, more so for runners who have been in the exercise for long. Knee brace for running helps to reduce pain and gives structural support after an injury. However, if the runner is getting rehabilitation exercise, it does not offer any additional help. Therefore, if you are experiencing pain in your knee when running, or you have a knee problem, visit your doctor to assess the problem. From them, it will be determined if you require a knee brace for running or you need to visit an orthopedic for any other knee problems. Knee sleeves are a type of neoprene braces that slide over the knee and have padding on the kneecap to offer protection or have an opening at the kneecap, buttress and/or strap to surround the kneecap. 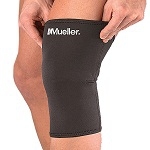 Knee sleeves will provide compression, warmth and knee support for running. They can be used for treating swelling or patellofemoral pain. Though they relive swelling and offer a feeling of support after an injury, they don’t give stability after surgery or injury. They may have sleeves that have additional padding or a stiff outer cover on the front part of the knee and straps which can wrap around your leg and keep it in place. These knee pads reduce the risk of injury, especially when you are involved in activities that make your knee vulnerable to potential direct blows like volleyball, biking, roller skating and skateboarding. However, they do not offer increased stability. This is also one great knee brace for running. 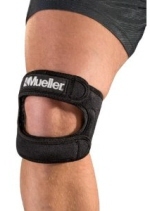 It is basically a knee sleeve that has an opening for the patellar and buttressing or straps around the opening. This limits the movement of the patellar, reducing chances of dislocation or subluxation. Additional stability may be offered when there are hinges along the sides of the knees. This brace can be used to lessen pain for people suffering from patellofemoral pain as a result of wrong tracking of the patellar. Patellar straps are becoming a kind of common knee support for running, especially among young athletes. A patellar band should be placed between the bump on the shin and the kneecap’s bottom. The band will apply pressure on the tendon which runs down your knee and inserts on the lower part of the leg. This will help to relieve stress applied on the tendon and other attachments around the tibia and it also relieves pain that is related with Osgood-Schlatter diseases and patellar tendonitis. These knee braces have hinges on the sides and straps to hold them in place. There are a myriad of hinged braces, but they all work by providing support ligaments within and without the knee. They are mainly used to prevent injuries when one is playing contact sports. Most of the knee braces are made of plastic or metal and can be adjustable in order to limit the motion extent. They provide knee stability after an injury or before surgery. 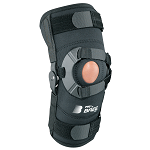 When selecting a knee brace, consider the amount of support required for your knee at first. This might be in line with the injury that you have suffered, be it a sprain, strain or ligament tear. In cases of serious injuries like knee dislocation, you should get a brace that offers maximum support for faster healing. The weight should also be considered when choosing the brace. Once you have determined the kind of knee brace for running needed, you will then consider what size will fit you best. Basically, the brace should be easy to adjust and fit snugly on your knee and the surrounding areas of your leg. For optimal results, follow the instructions that come with the brace as well as those from your physiotherapist. When picking out a knee brace for running, make sure it can move moisture away from the skin. This will make sure that you do not get blisters as a result of fabric rubbing on your skin. Ask for a brace that can expel moisture, especially if running in areas that have high humidity and temperatures. If you are buying knee braces for running, then you need to make sure the price is within your range. You could also get the braces under insurance if your physiotherapist or doctor has provided them. If you are buying, look around to get the best prices in the market.